East United Condos' sales centre location will be on site at the Old Christie, Brown & Co. Stables built in 1906 which is part of a Heritage Property. A Heritage Building Façade. 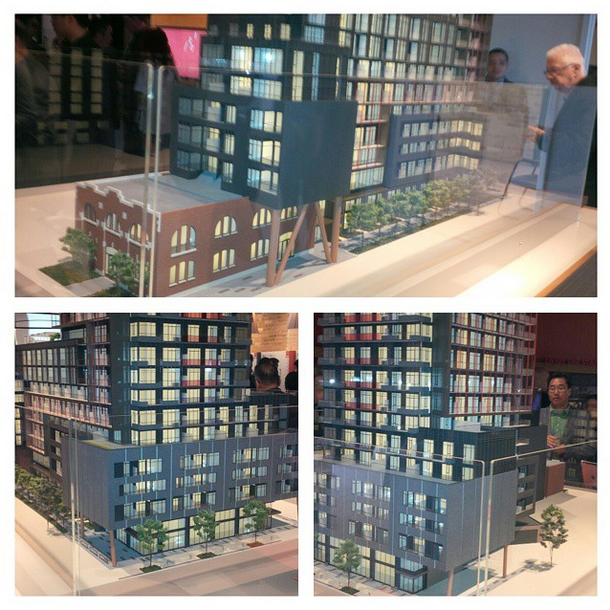 Studio units starting from $199,900 and 1-Bedroom + Den units starting from $229,900. Wood flooring throughout with a choice of quartz or granite countertops in the kitchen. 9 foot ceilings proposed and maintenance fee is $0.53 per square foot + Hydro. 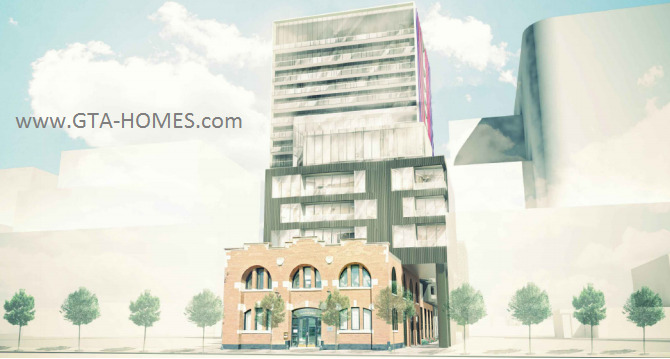 This proposed development frontages on both Parliament Street and Berkeley Street and will see a total of 279 dwelling units including 6 townhomes located on the south side of the tower with a total residential floor area of 20,181 square metres. There will be 254 square metres of retail space located on the ground level and 803 square metres of office space located both on the ground level and the second floor. The East United Condos proposal includes the redevelopment of this site for this 21 storey mixed-use building. In doing so, they are proposing to partially conserve and reintegrate the 2 storey brick heritage building known as the Christie, Brown & Co. Stables located on 93-95 Berkeley Street as part of the redevelopment. 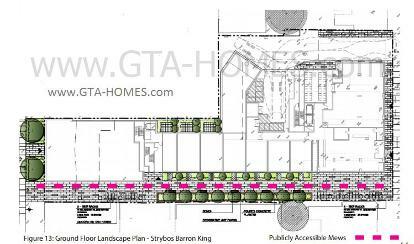 This proposal also includes demolishing the seven existing townhomes that is used for residential and commercial purposes along Parliament Street. The 279 proposed residential units will consist of studio units to 3-bedroom plus den units. 25% will be allocated for bachelor units, 42 % for 1-bedroom units, 23% for 2-bedroom units and 10% for 3-bedroom units. Studio units would be 346 square feet. 1 bedroom units range in size from 445 to 598 square feet. 2 bedroom units will range in size from 610 to 829 square feet. 3 bedroom units will range in size from 882 to 1,090 square feet. Finally, townhome units will range in size from 1,028 to 1,390 square feet. There are 194 vehicle parking spaces proposed in the 3 level of underground parking with access on Parliament Street of which 163 are for residents and 31 are for visitors. There are 298 bicycle parking spaces of which 249 are for residents, 34 are for visitors, 5 are for retail and 10 are for office. There will be one loading dock. East United Condos has a Walkscore of 97. 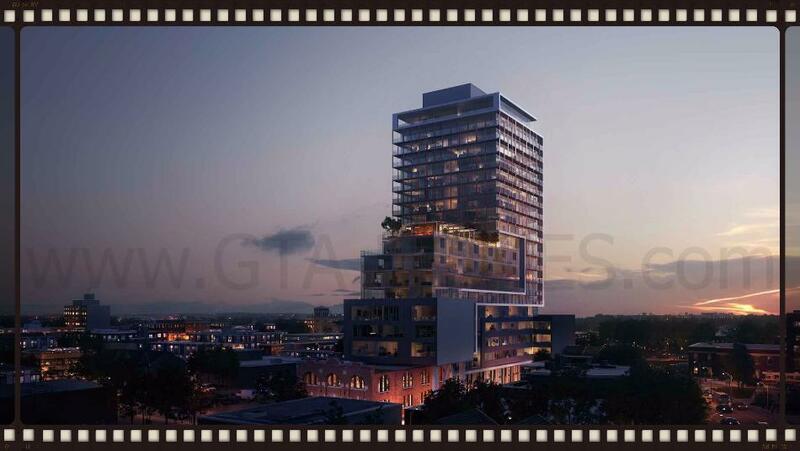 This development "site is a "L" shaped parcel located within the block bordered by Parliament Street to the east, Adelaide Street East to the south, Berkeley Street to the west, and Richmond Street to the north." 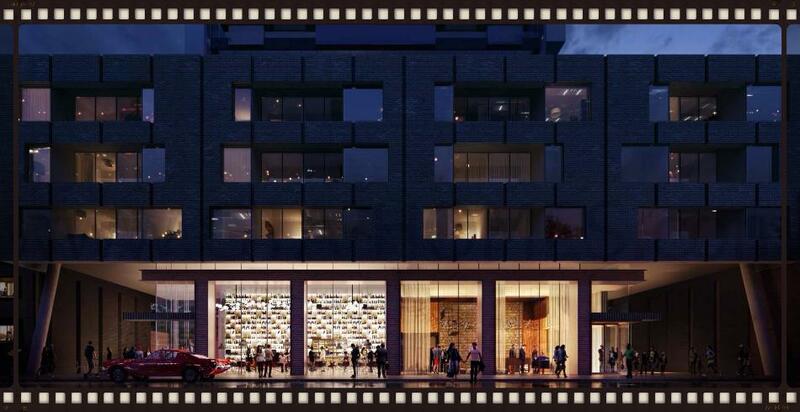 Access to retail space and to the residential lobby is proposed from Parliament Street and access to office space is from Berkeley Street. There is 596 square metres of indoor amenity space proposed on the ground level, 2nd floor and 11th floor and 350 square metres of outdoor amenity space proposed also on the 11th floor. Amenities would include a 24 hour concierge, a Pet Spa, an Artist Studio (workspace), an outdoor terrace, billiards, indoor party room, private dining, party room, private jam room, gym, yoga room and two guest suites. There will also be a Retail Café on the Main Floor. Live, play, work, learn, where you can actually live. Walk to the St. Lawrence Market, Corktown, Distillery, Financial District, subway or lake. Stay in and hang in the workshop, music lounge or meditation area. It's all united at this sleek, historic, electric condo in Old Toronto Neighbourhood. Downtown East now has it all. Close to the Distillery District, the St. Lawrence Market and George Brown College. "Discussions are continuing with demolition planned for early 2015." Register today for more information on the East United Condos by SigNature Communities!